These rooms have been designed to meet the needs and comforts of the modern traveller (bedroom is 24.5 metres squared). The room offers a king size bed, a desk and a spacious living area, a plasma TV, hairdryer, telephone, in room safe, I-pod docking station, bathrobe and slippers, complimentary mineral water and a welcome tray.The bathrooms have been fashionably designed in marble and contain a bath with shower. All rooms offer free WIFI. Please Note: The Culloden Estate & Spa is currently a NON SMOKING Hotel, this includes all bedrooms. Each of these elegant suites has been designed with an emphasis on comfort and convenience. 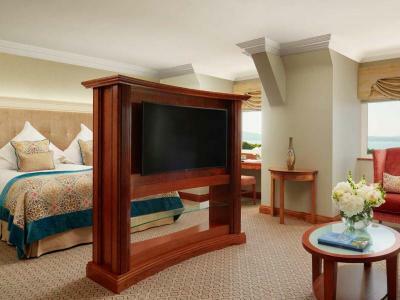 The suites are both spacious and are brightly lit by large windows, which have breathtaking views of the Antrim coastline, Belfast Lough and our landscaped gardens. Living areas are elegantly furnished and the marble bathrooms include double basins, large tubs and walk-in power shower. Every suite is equipped with a king size bed, a desk and a spacious living area, a plasma TV, hairdryer, telephone, in room safe, I-pod docking station, bathrobe and slippers, complimentary mineral water, all rooms offer free WIFI and a welcome tray. 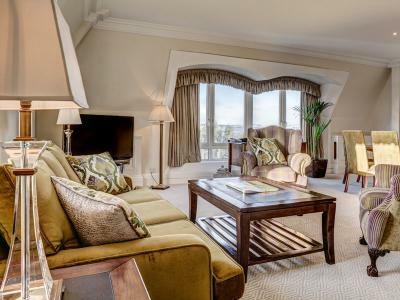 If it’s sheer unadulterated luxury you require, then the magnificent 2 bedroom Palace Suite is the choice for you. It has an excellent range of facilities, including a deluxe marble bathroom, and separate dining room and lounge area – ideal for those exclusive, private dinner parties! The suite is equipped with a king size bed, a desk and a spacious living area, a plasma TV, hairdryer, telephone, in room safe, I-pod docking station, bathrobe and slippers, complimentary mineral water, all rooms offer free WIFI and a welcome tray. 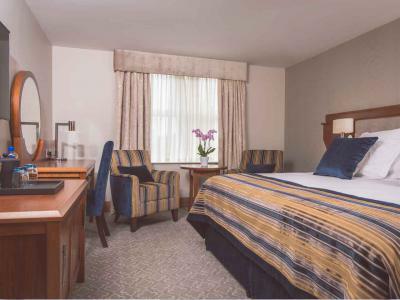 The suites are both spacious and are brightly lit by large windows, which have breathtaking views of the Antrim coastline, Belfast Lough and our landscaped gardens. Living areas are elegantly furnished and the marble bathrooms include double basins, large tubs and walk-in power shower. 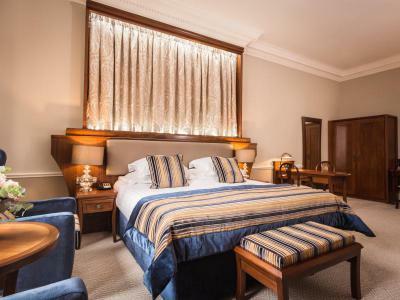 Every suite is fully equipped with a king size bed, a desk and a spacious living area, a plasma TV, hairdryer, telephone, in room safe, I-pod docking station, bathrobe and slippers, complimentary mineral water, all rooms offer free WIFI and a welcome tray.